America, mural detail, Chapel Atotonilco, Mex. 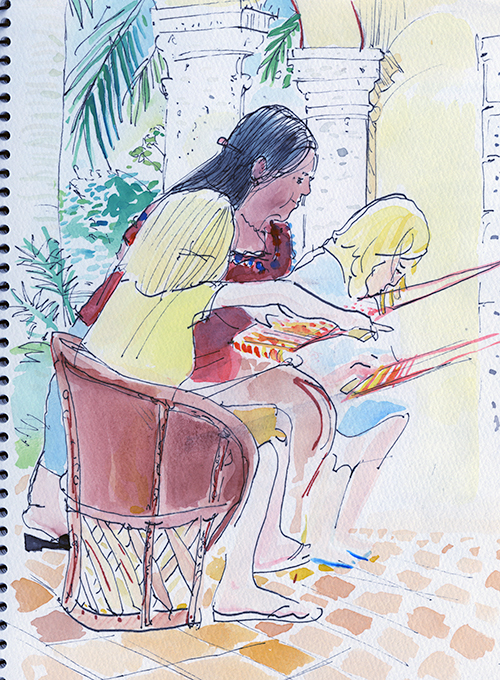 In a few days I find out if I have enough students to run a sketchbook class in Oaxaca, Mexico. Info on the class can be found here. 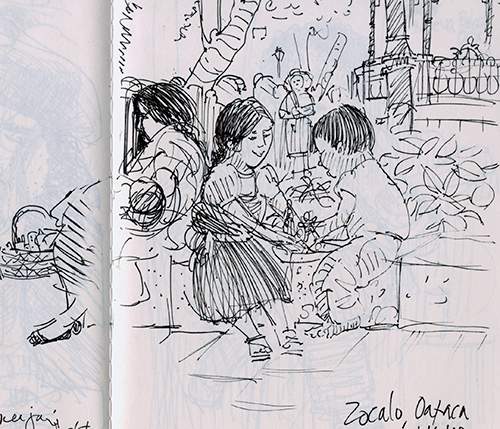 I’ve been looking through my Mexico sketchbooks. These pages remind me of the wonderful days I have spent in Mexico over the years. Sometimes my drawings are quick pen sketches. Sometimes I take time to add watercolor washes. Often they are drawn to remind myself about a particular place, like the restaurant Itanoni in Oaxaca. My notes remind me of Itanoni’s fresh organic corn tortillas. Itanoni also serves a wonderful hot chocolate drink, called champurrado, a type of atole made of maize flavored with cane sugar and cinnamon. 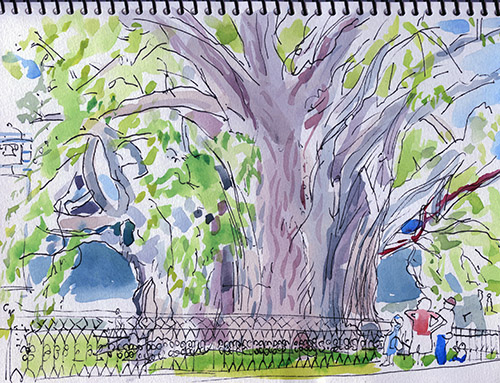 Sometimes I draw tourist attractions, like the giant Tule tree outside of central Oaxaca. I’ve seen people jump out of a taxi, snap a photo of the Tule tree and be gone in 60 seconds. Sketching forces me to catch my breath, to savor those few minutes I spent under the shadow of this ancient life form. Some call it the world’s largest tree. The Zapotecs believe it was planted by Ehecatl, the wind god,1400 years ago. With a circumference of 137 feet, it is wider than the giant sequoia of California. 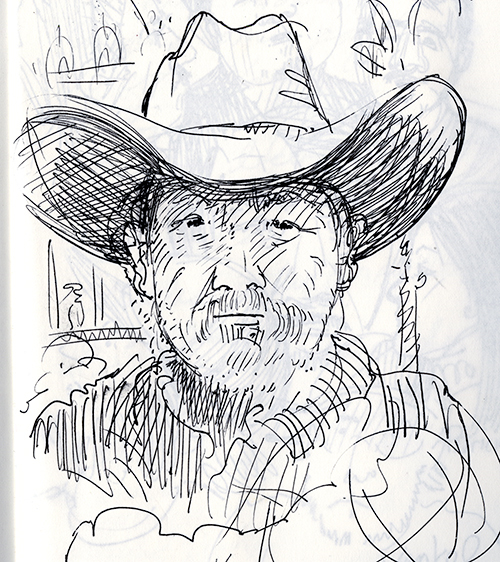 Once when I was drawing in the zocalo, Oaxaca’s central square, an old campesino asked me if I could draw his picture. I told him I would be glad to do so. He folded his arms across his chest and stared hard at me. A crowd gathered. Some thought I was drawing him all wrong, some thought I was doing it right. In the end, I showed it to the man and he just laughed and walked away happy. The crowd turned their attention to the marimba players and the balloon vendors. I kept drawing and I felt connected to the throng, like I was a part of the wonderful human opera of Oaxaca. I have a new sketchbook and I look forward to visiting Mexico again. Next > Believe It or Not: Illustrators can be Rich!